Futurepoint: Breaking the Interview Rules! Candidates are used to it. Most candidates will answer an interviewer's question in a sentence or two and then fall silent, waiting for the next question. The interviewer is likely to ask another question in that silence, and the candidate will answer, and so on. 1. Don't wait for the interviewer to ask you a question before speaking (examples below). 2. Answer some of the interviewer's questions with a tag (a question inside your answer) to gently nudge your interviewer off the script. Here's an example: "I did a mix of customer support and sales support things in my last job. Is this job more involved with customer support, or sales support?" 3. Take every opportunity you can (for instance, when you are asked an open-ended question like "Tell me about yourself!") to get off the script and into a human conversation. Ask a question about the role, or ask your interviewer to tell you more about the organization and its culture. The more free-wheeling and relaxed the interview conversation is, the more comfortable you and your interviewer will be. You will be more memorable. You will be in your power. Go ahead and break the old rule that says you must sit silently and wait for your interviewer to speak first! Thanks for inviting me. I'd love to hear about your history with the company! (Almost everyone likes to talk about themselves, and doing so will also make your interviewer more relaxed)." "You must be busy with [a project you read about on the company's website, or a recent news item]." "I'm glad to meet you! I'm interested to hear about your role, if you've got a moment to share." You are not trying to take over the conversation and control it, but rather through your friendly and open manner to give the interviewer social permission to put the script aside. Interviewers across the U.S. and around the world tell me that they're dying to get off the script but that most candidates are trained to followed the scripted approach. Most candidates dare not disrupt the traditional interviewer/candidate dynamic -- but I hope you will! Of course, there are other interviewers who would rather die than give up their interview script. They love it. They swear by it. They write to me to defend the stupidest interview questions you can imagine. God bless them. They are on their paths. Your job is to spot people like that and steer clear of them. If you get a bad vibe from the people you meet on a job interview, it's a signal from Mother Nature. Don't take the job. Here are ten interviewing rules you can break now -- and you must, if you want to get as much out of a job interview as you deserve to get. 1. Break the rule that says you have to sit across the table from the interviewer, hands folded and back straight, and crisply answer each question before going quiet and waiting for the next question. 2. Break the rule that says you have to wait for a predetermined spot in the interview agenda -- typically near the end of the interview -- to ask questions. If your question is organic to the conversation, ask it when you think of it. 3. Break the rule that says you have to keep your answers strictly on point like an oral exam in school. You can always answer a question with a quick story, even if it's not a story-type question like, "Tell me about a time when..." If the interviewer asks you how long you've been using Excel, for instance, you can tell a story about how you used Excel to rock the house. Then you can ask the interviewer, "How will the person in this job use Excel?" The interviewer may not know the answer! Their question "How long have you used Excel?" was a dumb question because they were only collecting data points like "One year," "Two years," and so on. That won't help them decide which candidates truly understand Excel. Your story, by contrast, will stand out in the interviewer's mind. 4. Break the rule that says your interview demeanor should be deferential and meek. If you are naturally meek, go ahead and meek your brains out. If you are not meek and you feel stupid trying to play a meek character, don't do it. Only the people who get you, deserve you after all. 5. Break the rule that tells you to keep quiet about an energetic disturbance in the room. 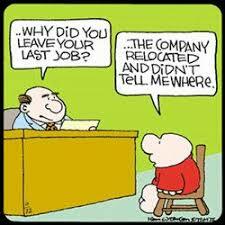 Sometimes a job seeker goes on an interview and realizes that the job is a terrible fit for them. They'd hate the job, but they don't say anything. They are trained to stick it out through the whole interview, even if they are scheduled to meet three or four different people. You don't have to do that. You can name the elephant in the room. It's a great thing to do. You can tell the person you're with, "It's fantastic to meet you, but it's obvious that this isn't the right role for me. I hate to waste your time. What do you think we should do?" They might say, "Don't worry! If you are game, we'd love to keep talking with you because we always have different job openings becoming available. Does that sound okay?" Speak your truth. Don't stay silent if there's something that needs to be said. You will open up the energy by speaking up, and you and everybody around you will benefit. 6. Break the rule that says you have to tell the interviewer whatever they want to know. Don't give away personal information like your current salary, your managers' contact info or your marital/parental status just because the interviewer asks for it. Anyone who has taken a mojo crushing job before will tell you that there are worse things than other month of unemployment. Walk away from organizations that don't respect your privacy. 7. Break the rule that says you can't take a pause. If your conversation goes on and on, go ahead and ask for a quick break. Get a drink of water or a cup of tea or coffee. It is easy for interviewers to forget that a candidate may have been sitting in dusty rooms for hours. 8. Break the rule that says you must wait around in windowless conference rooms while people figure out what to do with you. Break the rule that you must overlook any impoliteness on the part of your interviewers, be infinitely patient with an organization's incompetence and put up with bad treatment. You don't have to do any of those things. You can get up and leave the interview if things get really bad. When you enter the interview facility, keep track of your location relative to the exit, no matter how many twists and turns you take. Also, do not hesitate to ask anyone you see, "Where is the exit, please?" rather than wander around in a strange building trying to escape. 9. Break the rule that says you must try to be the applicant the interviewer was expecting to meet. Sometimes, you'll be in an interview conversation and see a flick of surprise mixed with disappointment on the interviewer's face. Sometimes there is even a flash of irritation on the interviewer's face, as though they are thinking, "How dare you walk in here not being from the person I envisioned?" You may see the interviewer's face change when you answer a question differently than they expected you to. That's fine. Don't make a course correction. There is nothing to correct. Let your interviewer get the learning Mother Nature wants him or her to have. You are already more memorable for not having been the cookie-cutter candidate the interviewer pictured in their mind. 10. Above all, break the rule that says the interview is a dog and pony show during which you, the applicant, get to prove that you are worthy of employment. A job interview is a two-way street. You are checking the organization and its representatives out as much as they are checking you out. If you feel insulted, dismissed or treated badly at the interview, things will not get better once you get the job. Take heed of red flags, and take off! A job interview is nothing to dread. You have no one to impress. You are you, and you are awesome. The people who interview you may appreciate your brand of jazz or they may not. Who cares what they think? They are bit players in your movie. The right employer for you is out there. You will know when you meet them. In the meantime, focus on the amazing path you have already followed and the many people you have helped. It will be easier for everyone to see your awesomeness when you feel it yourself!